So here we finally have what has to be THE most anticipated rehearsal of the day: Italy! We saw Francesco Gabbani arrive at the airport yesterday and now he is here in the IEC. Does it look like a winner after one run? I think not. It sounds well and the graphics have some nice elements but overall it is kinda messy. Many eastern symbols (in that sense it reminds me a bit of the Armenian performance but of course the song is completely different). The dancing gorilla is of course still there and we have also four backing singers who join in the choreography. Compared to the San Remo performance Francesco uses the stage more in between, less standing at one place. 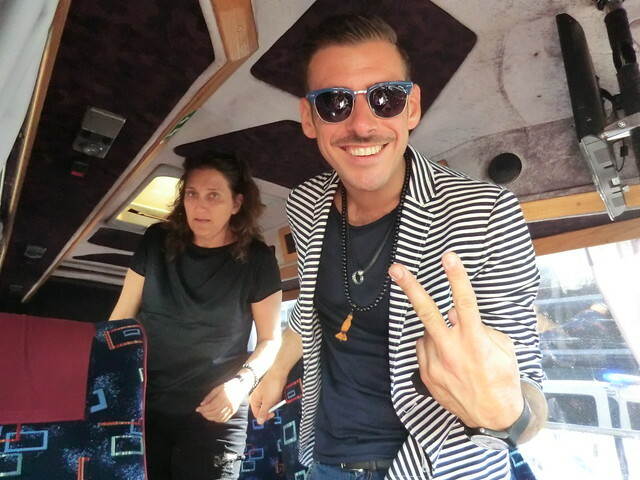 Francesco Gabbani (Italy) is here! The big favourite of this year is still Italy and today we will see whether he's going to live up to his potential. Yesterday afternoon he arrived in Kyiv and ESCKAZ was there! Read more about Francesco Gabbani (Italy) is here! Francesca was so nervous about her first rehearsal, that she hardly slept last night. The message in the song is about the "Six degree of separation", so Francesca wants to show, that we are all equal. There is no degree of separation. She compares us to apples. There are green apples, there are red apples and so on, but we are all the same. Il Volo just did their first run and there's a lot of improvement visible already. We're seeing a lot more camera angles first of all, but there's also a lot more dynamics going on between them. Piero in particular is finding the camera's much better than in the first rehearsal. Great improvement for Italy and a confident contender in my opinion. We had a chance today to see the opening ceremony of the Eurovision Village at the City Hall Square with a unique show idea FASHION FOR EUROPE. The idea is about designers and brands from many different participating countries building bridges through fashion. In total it took 1.5 hours to present 14 brand: Agnesa Vuyhaj (Albania), Sinoian (Armenia), Lena Hoschek (Austria), Fakhriya Khalafova (Azerbaijan), Bernard Depoorrter (Belgium), Ivana Helsinki (Finland), Atelier Michalsky (Germany), Galia Lahav (Israel), Calzedonia (Italy), Daili (Lithuania), Sanja Matijevic (Montenegro), Blessus by Michael Hekmat (Poland), Adelina Ivan (Romania), Julian Zigerli (Switzerland). While I arrived (in the middle of a thunderstorm) on Thursday, I’ve only been in and out to the Eurovision bubble on a couple of occasions in the past couple of days. The good news is that the weather has improved, although it is very overcast this morning and it was almost like walking through a post-apocalypse landscape through Vienna city centre as for once, the Viennese weren’t all up and about before nine. Given the lateness of Saturday night for many of the Eurovision journalists/fans, it’s amazing to see the press centre so full for a 9:40 rehearsal. It had to be something special to get people up and working before ten a.m. on a Sunday and the clever Eurovision schedulers have put one of the big favourites first, in today’s rehearsal running order. The boys from Il Volo are in matching navy and pleated shirts and standing side by side in a performance area ringed in blue. Behind them some ancient sculptures provide the perfect setting for this classically inspired song. The backdrop explodes in light for the chorus and mid-way through the song, the whole staging goes to a warm yellow (a popular colour this year). 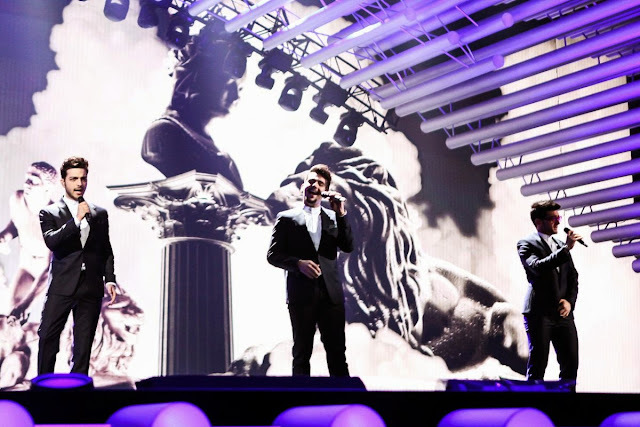 Il Volo are in fine voice for all the run-throughs, although the song lacks the natural progression, having dropped the second verse to make the three minute limit. There’s a bit too much shoe-gazing for my liking and the long shots don’t do anything bar show off the stage rather than concentrate on the performers, but I haven’ seen a more complete rehearsal so far. This is certainly a serious contender for Italy’s third Eurovision victory. The day starts with second favorites Italy which are pretty competent considering it's a first rehearsal.The boys appear with black suits and white shirts and they give a performance similar to what we've seen from them before.The backdrop is *very* Italian, full with different statues and columns in a blue-black background which turns orange-golden in the process and purple with stars towards the end (kind of the same concept as "Watch my dance" but...in Italian). Backdrop is a bit cheesy for my taste; however there will be fans for it. They did miss a camera or two but that's what dress rehearsals are for.They got a big applause from the press centre. Personally, i am not ready to say this is a winner. The performance lacks a connection between artists and the camera, and that is probably one of the most important things for Eurovision. They are performing not for the audience in the hall, and not for their fans, but for the millions of viewers who see the act for the first time in their life. And for the first time viewer the backdrop may seem to be impressive, but the band is too static on the stage and lacks eye contact with the camera. Perhaps, they are not yet too comfortable with the stage. The song is still the winning material but the staging needs to be improved to connect with the audience. Italy have just taken the stage for the first time and it's looking very good for the three young Italian guys. They're all wearing the same outfit, which consists of a black suit, white shirt and red shoes. The predominant colours for the staging starts in dark blue, but progresses to a orange backdrop on which several famous Italian statues appear, which are accompanied by white lightning around the stage. Vocally these guys are simply astonishing, there's no question about that. My question is whether the European audience will get the very Italian, static performance though? Right now, not all Il Volo members are connecting with the camera and that's really going to be necessary. Pierro in particular is really struggling finding the camera actually. And that's a little bit worrying. But they did it in Sanremo, which they won, so I'm undoubtedly confident they'll be doing the same. Italy starts the Big 7 today with a Grand Amore song performed by Il Volo. Well, I must say it was amazing. I'm not a big fan of this type of music but it sounded professional, well done and impressive. They are all dressed in classic black suits and white shirts. The background is mostly blue, white and golden with images of monuments and sculpture from all over the world. To be honest at some point I got goose bumps. And I'm in the press centre, not on the stage.